Dr. Lisa Oskardmay strongly believes in the power of the body to heal itself when provided with the right tools. As both a Licensed Acupuncturist and Doctor of Chiropractic, Dr. Oskardmay can provide unique healing and pain relief to patients in the Triangle Area. She graduated from the University of Maryland, College Park and holds undergraduate degrees in biology and zoology with honors in zoology for medical research performed at the National Institute of Health. After graduation, Lisa spent two years living and working as a teacher with the US Peace Corps in Belize where she encountered acupuncture and herbal healing, as well as chiropractic. She experienced the benefits of each type of health care, marveling in the hands-on effectiveness and the opportunity of each method of healing to provide a personalized approach to health care. Lisa attended National University of Health Sciences (National College of Chiropractic), completed an internship at the Chicago Salvation Army Clinics, and graduated in 1995 with a Doctorate in Chiropractic and an initial basic Certification in Acupuncture. In 2010, Lisa attained a Master’s Level certification in Acupuncture at Jung Tao School of Classical Chinese Medicine. She opened Wellness Center Chiropractic and Acupuncture in 1995, then moved with her family to Chapel Hill. In 2015, she moved to her current professional office at 800 Eastowne Dr. #103 in Chapel Hill, NC 27514 where she maintains an active practice. She particularly enjoys seeing the joy in a new patient’s eyes when they experience their first adjustment or acupuncture treatment; it is very rewarding to have patients who have been patients for years refer friends and family to help them achieve the benefits they have received. She appreciates cross referrals from numerous health professionals in the community, as well. Many people come in for acute pain relief, many others come in for the preventative health benefits chiropractic and acupuncture provide. 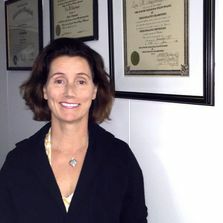 Dr. Lisa enjoys helping people improve health and physical and mental balance using a combination of techniques ranging from chiropractic and acupuncture to nutrition and exercise, to posture analysis and stress relief. We frequently get asked the question: “Why do you use both chiropractic and acupuncture when other clinics only use one of them?” Dr. Lisa recognizes that both hands-on treatments are valuable in their unique way and complement and work well together, enhancing the body’s ability to heal itself so that you can start feeling better faster. People save time, energy and money with the opportunity to choose one or both treatments in one treatment setting at the same visit. Whether you’re interested in Chiropractic and or Acupuncture for pain relief or preventative medicine, call our office or schedule an appointment today. Take that first step – you’ll be glad you did. “Dr. Oskardmay relieved pain I had been dealing with for about a week. She also explained my problem in a way that I understood, which no other Doctor has been able to do. I look forward to my next visit and the relaxation I felt after my last adjustment.” – Fluff B. “I have been going to Dr. Lisa for 4 weeks now and I see a significant difference with my chronic nerve pain and finally feeling some relief. I have been working with my neurologist for over a year and I was very dissatisfied since I had two MRI tests and EMGs and still no progress forward. I was also going back to pain management and the only suggestion was to up my prescription intake. I am a full believer in holistic medicine. Dr. Lisa has provided this for me. She took the time to “really” listen to my story of chronic nerve pain and provided a treatment of acupuncture and chiropractic practices that really works. I feel I’m on my way to optimal health and well-being instead of just treating my symptoms for nerve pain. The staff at Acupractic Natural Healing is very friendly and professional. Dr. Lisa is very knowledgeable and attentive to your needs. She is A-M-A-Z-I-N-G!! I would highly recommend Dr. Lisa if you want to be free from chronic pain.” – Kathy B. “I came to her in serious pain, with limited mobility after 8 weeks pain meds and PT. It’s amazing how one area (of course the back) can affect the rest of the body. As an older woman with osteoporosis and a very weak core muscle structure, it is difficult to hold myself upright. I favor the wrong muscles. Dr Lisa has begun ‘straighten’ all that out for me. Acupuncture has an amazing subtle effect. With her patience, keen interest and professional knowledge, I am healing. Healing from within to where I can take over and be a strong active adult again! Thank you, Dr. Lisa!” – Bobbie B.
Dr. Oskardmay helps patients with Chiropractic and Acupuncture in Chapel Hill, Durham, NC for over 23 years. Great for pain reduction. Insurance accepted. Acupractic: serving the Triangle since 1995 with quality alternative medicine. Acupuncture and chiropractic natural healing help you heal your back pain, neck pain, shoulder pain, knee pain and foot pain naturally.